A while back, I posted about our experience making Disney Park Map Magnets. We had so much fun making them that we wanted to see if we could find a similar project. We like making crafts that we can use and still remind us of our trips or vacation. 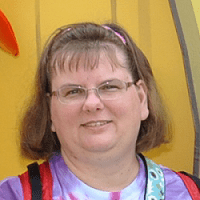 Recently, we took a trip to Hersheypark. We had a great time, so we brought a few extra maps home with us to use in craft making. We decided to make DIY Theme Park Map Coasters! We didn’t need a lot of supplies, but I did have a hard time finding the cork coasters locally. I did find them on Amazon, though, at a good price. 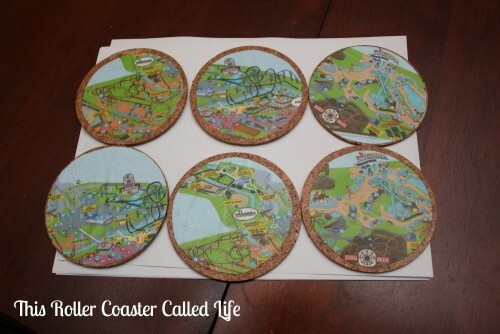 We started by picking out the parts of the map that we wanted on the coasters. Each of us had a map to work with. We traced the coasters on the map and then cut out the circles. 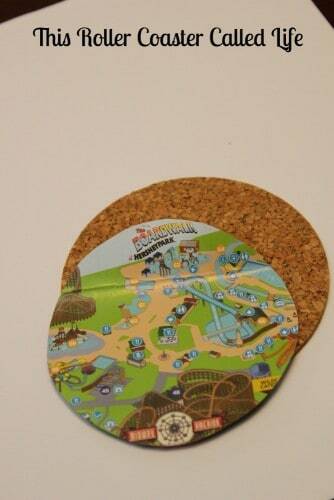 We then trimmed the circles down a little, so the map was not larger than the coasters. 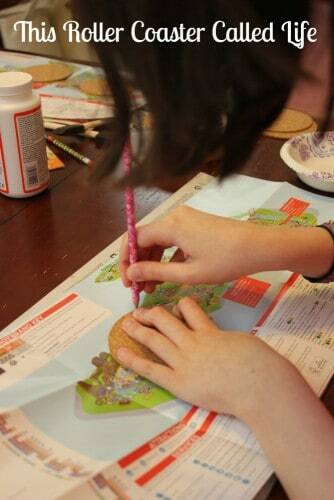 At this point, we were ready to use the Mod Podge to glue the map to the coaster. 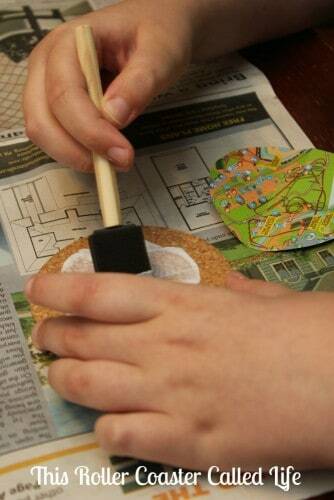 I poured Mod Podge into paper bowls, so each of us had our own bowl close by. We put three layers of Mod Podge on top, allowing each layer to dry before painting on the next. At the end, I took them outside to spray them with the Clear Acrylic Sealer. 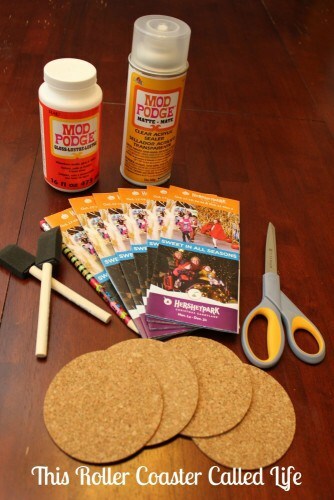 I felt the Mod Podge was just a little “tacky”, but the Clear Acrylic Sealer made it smoother. Here’s our first batch finished. We can’t wait to try them out! Obviously, these can be made with park maps from any theme park, and you could even use regular maps from your trip planning. 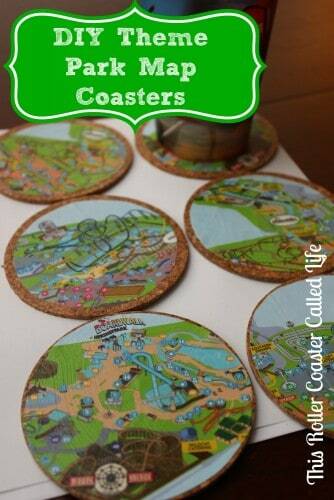 What theme park maps would you use to make your map coasters? This is such a cute idea. I love that kids can create the coasters and they do not cost a lot of money to make! That is a darling idea! What a great gift idea! My sister in law LOVES Disney and this would be a really fun Christmas present!! Thanks for sharing! What a cute idea! This would be a great project for the kids. what an adorable idea!!! I Just love this. This will make a really special craft for my boys to do. cool! Okay, these are just super cool. I would never have thought of this but my kids would love to use maps from their favorite theme parks for other things – I’m going to go check out your magnet post now because I think they’d especially get a kick out of that! This would be a fun way to have a keepsake from a park without having to spend a lot in the park. What a great momentos of travels! Cheap and easy to make too! That’s a clever idea. Definitely a fun craft! I absolutely love this idea. What a great way to reuse those maps. This would be a great way to keep a memory alive. I might have to try this! oh, this is GREAT! We’re headed to Disney/Universal in October and we’re looking forward to it. Now we can make gifts with maps !! LOVE these! They are so cute! And what a great idea! I’ve tried something similar to this before, but my coasters must not have been thick enough. They curled all around the edges. I think yours turned out wonderfully. Thank you, Crystal! These coasters really aren’t very thick. I love Modge Podge! 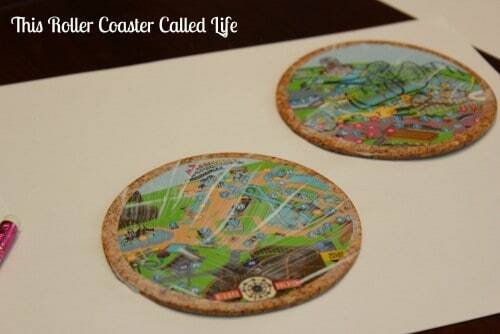 I’ve been wanting to do coasters too. Do they absorb the water or is that why I need to spray them with acrylic? P.S. The maps are super cute! Donna, I’m not sure if they will absorb water without the spray or not. The one benefit that I see is that the matte acrylic spray made it less shiny than without. Love this! What a creative and expensive touch to the party! Now this is really cute!! What a neat way to keep something from a trip, but still have it be useful! I love this! I just made some recently with WDW park maps! 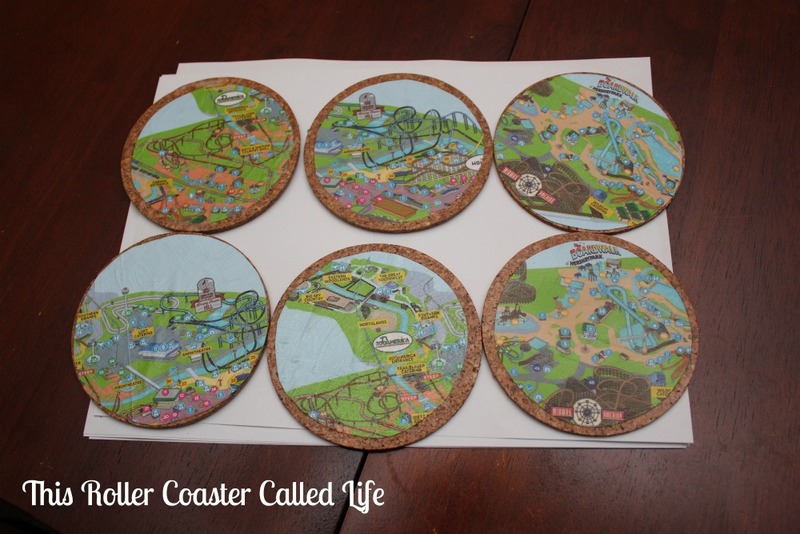 How fun are these map coasters?! Such a fun way to remember a great vacation trip. I think we would do something local or Disney. This is such a cool project. We could use some coasters for our living room. What a great way to remember those fun times at your favorite parks. We always have maps left over when we go to theme parks. What a creative idea! This would be perfect for folks that like to travel! These would make for great souvenirs or even birthday gift thank yous. Love this idea and totally going to use it the next time we do something like this. Oh what a wonderful way to relive family memories over and over again. Love it. Such a cute project, my kids would have fun with these! This is so cute and it looks fun to do! This is very creative. I was just looking at my old coasters a few days ago and thinking I needed to get rid of them. This has me thinking! That is such a cute idea! I would have never thought of that. What a cool idea for a nice memento of a vacation! That’s a perfect and inexpensive way to remember the fun you had. Great idea!